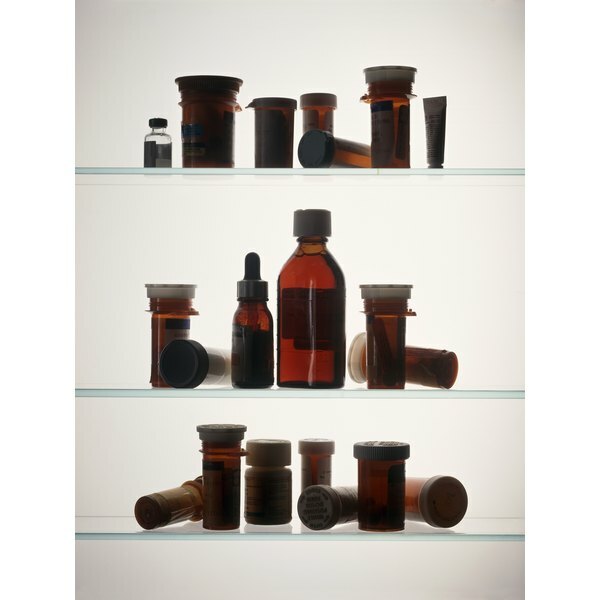 Cough syrup and other unused medications are a concern when disposed of down the toilet, drain or sink. Their residue has the potential to contaminate groundwater, rivers, streams, lakes and oceans, which can affect fish and other aquatic life. Therefore, the U.S. Fish and Wildlife Service, the American Pharmacists Association, and the Pharmaceutical Research and Manufacturers of America are advising consumers to dispose of cough syrup and similar medications in a safe manner that helps protect the earth’s surface waters. Examine the cough syrup. If it has solidified or partially solidified, mix in some water and shake it to help dissolve it. You may need to insert the handle of a spoon or a screwdriver in the bottle to break up the dried cough syrup first. Pour the liquid medicine into a plastic bag that is sealable, such as one used for storing food. Add something solid, such as dirt, coffee or tea grounds, sand, or cat litter, to the cough syrup to make it thick, inedible and unattractive to pets, children and even adults. Seal the bag and throw it out in your everyday household trash. Seal the bottle as well and throw it out or recycle it. Be sure to remove the label first since it has personal information on it. Soaking the bottle in water first will help. Ask your pharmacist if there is an upcoming prescription take-back day sponsored by the Drug Enforcement Agency. You can dispose of your cough syrup and other unused medications at specific drop-off locations on that day, if desired.